The gold to silver ratio (G/S ratio) is nearing a critical make-or-break point. This will impact the prices of both metals in 2019. Let us update our analysis on the ratio, which measures the number of ounces of silver required to purchase one ounce of gold. The ratio remained stubbornly elevated throughout 2018 and into the new year. For the week ended February 1, the ratio closed at 83.0. 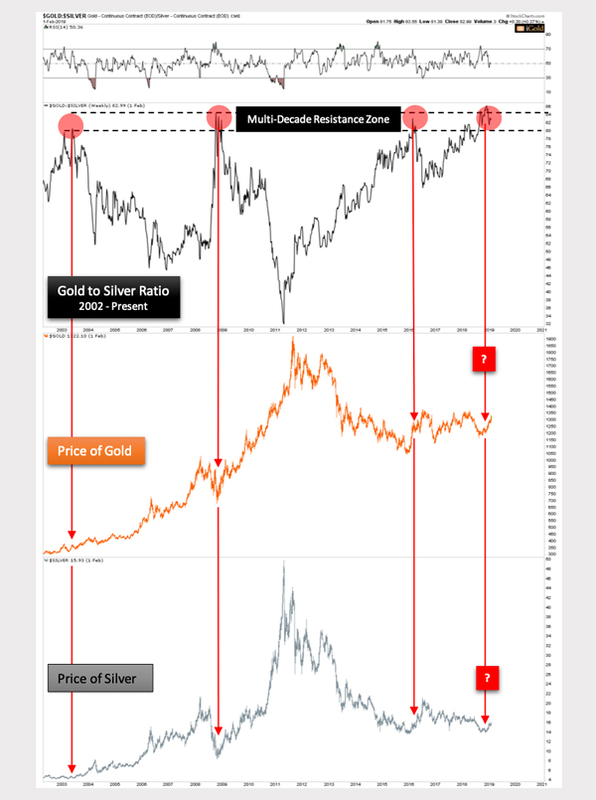 When the ratio is rising in favor of gold, this tends to correspond with falling prices for both metals, as capital seeks relative safety in gold during deflationary events. When the ratio is falling in favor of silver, this tends to correspond with rising prices for both metals, as capital seeks greater leverage that silver can provide during inflationary periods. Yet, contrary to many analysts who have assumed a major low would manifest again simply because the ratio was above 80, we have been more skeptical. The consensus view was especially brought into question during mid-2018. We observed the ratio not retreat lower but instead break higher above the resistance zone (black), reaching 86.5. It increasingly appeared that a breakout scenario was forming, which would indicate silver might fall to a record low versus gold. Closing the week at 83.0, there has been increased talk in recent weeks of a top being solidified now in the ratio. The idea follows that the next major advance in both metals would be on our footsteps. If we cannot call this a top in the ratio yet, what would it take to solidify such a call? We need to see a negation of the lower boundary of the resistance zone (black) at 80.0, and a break of the primary rising channel (blue) at 79.0. This channel has defined the upward slope of the G/S ratio advance since mid-2016. And as stated above, advances in the ratio tend to correspond with weakness in both metals, and indeed especially silver, which fell to below $14.00 just two months ago. Note that the primary channel (blue) is still rising. So its support boundary will converge with the 80 figure in April of this year. Thus, 80.0 on the gold/silver ratio will take on increased significance over the months ahead. Again, for the week the ratio closed at 83.0. The ratio is indeed a useful measure of investor interest in silver relative to gold. Further, it can help us gauge the likelihood for stronger advances in both metals. As increased “anti-fiat currency” buying interest enters the sector as the ratio is falling. A break below 80 and 79 are necessary to witness a more sustained decline in the ratio and advances in both metals. These two levels are converging on the key 80 figure within the next three months. The model calls for a resolution to this pattern by end-2019. 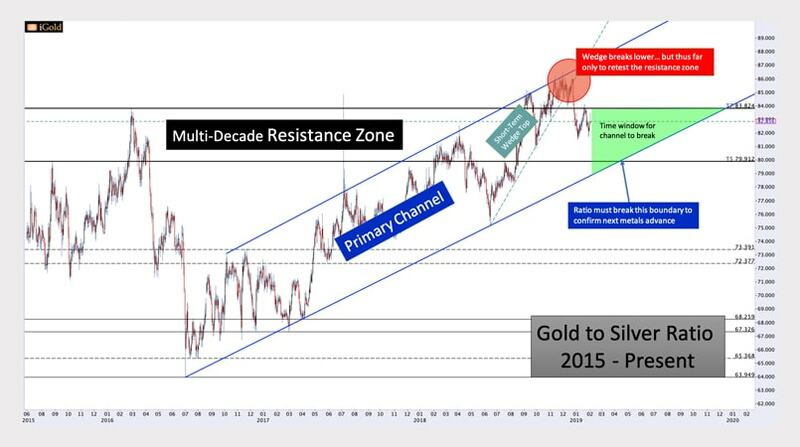 This is a top market indicator to watch for the year ahead for precious metals investors.